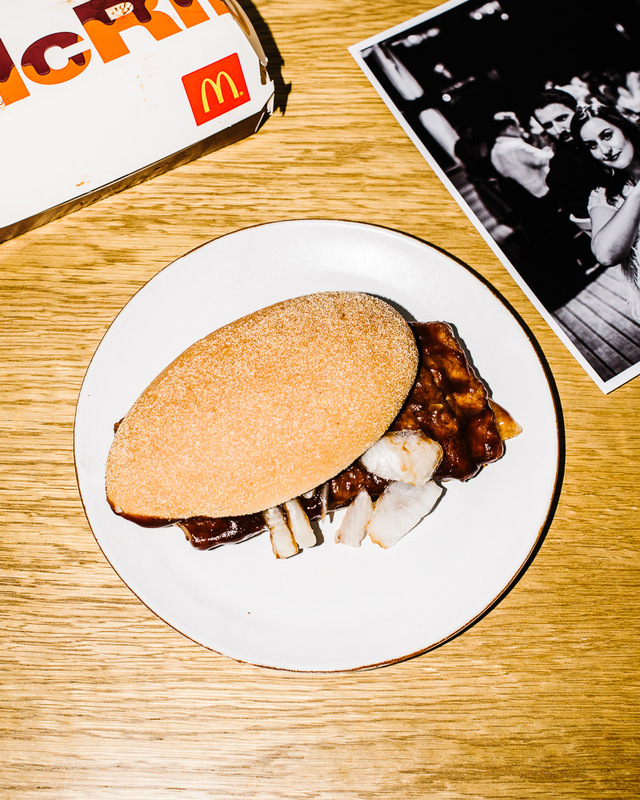 I have been sick and useless for many months, but today I found the light within and seized the McDonald’s McRib. Hastily thrown together, a dumping of lethargic, hacked up onions plastered to the sides of the box by too much sauce. This sloppy indifference has become the beneficiary of all my adoration. After years of writing about limited time only fast food I’ve come face to face with my muse. I want your disdain. I am your fangirl. I’m simply so weak I would give everything for you. I don’t care you’re not a real rib! I don’t care that you’re made of yoga mat bleach! Fake corrugation! Misplaced pickles! All these chest pains! You’re useless and succulent and just what I need. I can only respect the fact that this consumerist, corporate, capitalist concoction of over 70 artificial ingredients tastes just like pork ribs in a bun. As I take this photo on my husband’s desk, a picture from our wedding leaning against the wall falls and slumps besides my plate. A reminder of how things were. I reminder of how things could be. But, no – the McRib is here.